It is important to us to help you create a workflow that is as smooth as possible. This week, we’ve added three new features that will do just that by making it easier than ever to find the exact Activated Checklist Instance you need, right when you need it. The new features are Search, Sort, and Pin. Search is available after you have clicked “View All” in the Checklists tab on the dashboard. This feature allows you to search for words in the Activity Title and the master Activated Checklist/procedure, and will return only the Instances that match your search criteria. 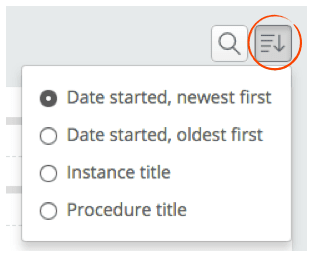 The Sort feature allows you to sort the Activated Checklist Instances in your list by date or title. Like Search, Sort is available after you have clicked “View All” in the Checklists tab on the dashboard. The Pin feature allows you to pin Activated Checklist Instances to the top of your dashboard list so you always see your most relevant Checklist steps first. This feature is useful for companies that are running a large volume of Activated Checklist Instances for each user. The user is able to pin the ones they are working on to the top. When they are completed, they disappear from the top. Instances can be pinned in the main dashboard as well as the full list you see after clicking “View All” on the dashboard. All three of these new features are live and available now in your Way We Do account. See detailed instructions for using each of the features by following the links below. As always, we are happy to help you make the most of Way We Do. Please feel free to send your comments or questions to support@waywedo.com and our friendly support team will be quick to respond. We’ve upgraded our manual styles to improve the way you view your manual, both online and off. At Way We Do, we value your feedback. We’ve upgraded the Activated Checklists in Way We Do with full screen view, paragraph breaks and synchronization of steps with procedures.